It’s trying to set up a drug rehab centre in Meath. Signs on the door of a local community centre in Ballivor. A SCIENTOLOGY-LINKED drug rehab centre which had its planning refused despite most of the building work being completed has gone to the High Court in a bid to quash An Bord Pleanala’s decision. 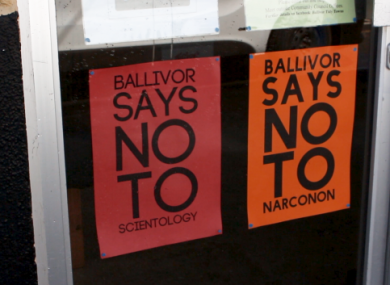 The centre, which is based in Ballivor, Meath, is called Narconon – a programme developed from the works of L Ron Hubbard, founder of the Scientology religion. In December 2014, planning permission was granted for a nursing home at the Old National School site in Ballivor by Meath County Council. In September 2016, Meath council made a declaration confirming that, in the light of the permission already granted and the similarities with a residential drug rehab, that no further planning permission was required for the site to be used as a drug rehab facility. However, An Bord Pleanala made a contradictory declaration late last year. It is this declaration which has been stayed and is being challenged by judicial review by solicitors acting for Narconon. Their drug detoxification programme uses high doses of vitamins along with long periods in dry saunas which it says is an attempt to flush toxins out of your body. A consultant psychiatrist in substance misuse from the National Drug Treatment Centre said that Scientology’s programme has no basis in science.has previously said that “Scientology’s drug treatment programme has no standing amongst medical professionals involved in the treatment of persons with alcohol and drug use disorders”. Locals have been battling to keep the facility out of Ballivor and regular protests have taken place outside the construction site. Another protest will take place outside the centre tomorrow. According to a press release sent out by a spokesman for both Narconon and Scientology, Narconon centres “have been saving lives for more than 50 years in 18 countries”. However, health services across the world, including the HSE, think their methods are “potentially harmful”. In response to the HSE’s claims, a spokesman for Narconon previously said: “Narconon follows the laws and regulations of the country in which they operate. Narconon prides itself is setting and maintaining the highest of standards in all aspects of the programme. Email “Scientology-linked drug rehab centre goes to High Court to quash planning refusal”. Feedback on “Scientology-linked drug rehab centre goes to High Court to quash planning refusal”.